ZipTour’s dynamically controlled trolley brake in action at Sundance, Utah. Ski resorts, zoos, amusement parks, cruise ships, and more are increasingly bringing zip lines into their business fold, expanding opportunities for consumers to get in on the thrill. Along with that prevalence has come an increased concern and awareness about safety, especially in regard to braking systems, which have experienced a good deal of evolution over the past decade. Here we take a look at the status of zip-line braking, and how these systems might move forward with the industry. 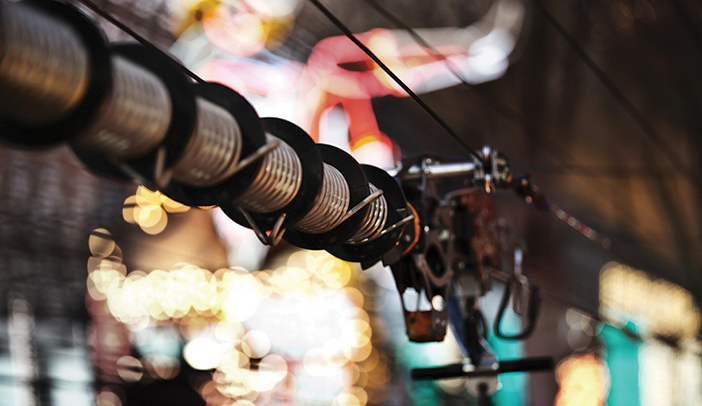 Standards and regulations related to zip-line braking are forcing some of the change. Many post-2011 installations, especially commercial operations, require the use of both primary and emergency, or backup, braking systems. Urged on by regulations and operators, who seek effective and high-throughput systems, innovative companies have developed systems that have pushed the industry forward. Kevin Smith, CEO and founder of Skyline, based in British Columbia, believes the industry’s growth has undoubtedly spurred a great deal of innovation and evolution. “I have been quite impressed with the safety and quality of courses I’ve seen,” he says. Dylan Burt, general manager for Bonsai Design, agrees that operators, builders, and suppliers have learned a lot over the years. He notes that the higher volume of people on zip lines, and the greater knowledge base that has been developed, have served to educate and inform the industry about where improvements are needed. 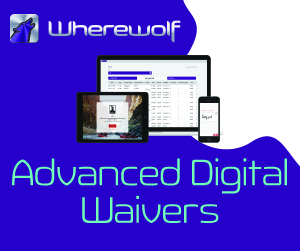 Even the increasing regulation of the industry has proved beneficial. “I got started in the industry in 2004, and … the innovation and regulation has been great for the end consumer,” he adds. Braking began to evolve as zip lines exploded in popularity during the early-to-mid 2000s. This has been especially true for commercial operations, for which passive braking has grown in popularity over active braking. 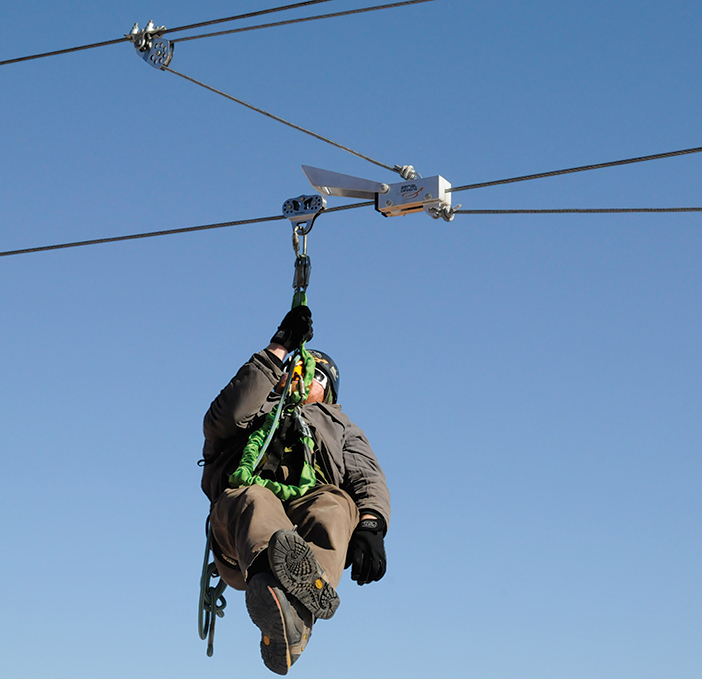 While active braking methods—typically hand braking, in which the rider uses his or her leather-gloved hand to slow down by pressing down on the cable, or some form of guide-activated braking system—are still popular in many applications, the culture and regulations around zip lining have also pushed operators toward passive braking systems that literally take decisions out of the hands of guests. Bonsai Design’s Big Zip Brake System, in design and in the field. Some still see guest or guide involvement as integral to the zip experience. Tommy Cooper, who was a course guide for five years and is now director of operations for Hackwell Innovations, makers of the ZIPKEA brake, saw that guests often liked to hand brake and interact with the guide. But he also gets why active systems are now being “phased out. When a guest is going 25 mph and putting [his or her]hand near the cable, that creates risk,” Cooper says. Valdo Lallemand, the founder of Aerial Designs, continues to believe in active braking—for guides in particular. The Aerial Braking System (ABS) that he designed eight years ago is a low-cost, active system in which the guide is involved in both the braking and retrieval process. “It’s a simple, robust, affordable braking system,” says Lallemand. He questions whether automated systems are inherently safer. “Automatic does not necessarily mean safer, it means more automatic. If the operator doesn’t do his job with an automatic system, serious accidents can still result,” he adds. A modern spin on active braking is the dynamically controlled trolley brake designed by Terra Nova for its ZipTour systems. The ZipTour trolley has a rider-activated braking system: riders pull down on the handle to release the brake, and let up on the handle to slow down. The interactive nature “creates a much higher repeat ridership,” says Eric Cylvick, founder and CEO of Terra Nova. And, since ZipTours are typically designed as dual, parallel lines, “Our ZipTour trolley makes the experience a lot like skiing, where you can share the experience with the person riding next to you,” says Cylvick. Mark Reich, senior product development engineer for Head Rush, understands that while some guests prefer to be a part of the experience, the risk from use of hand brakes is real. “There is the human element with hand brakes, the orientation of the rider comes into play, as well as other safety concerns,” he says. Passive systems function even when a rider is incapacitated, Reich points out. He cites an incident in which a guide was incapacitated by a lightning strike while on a line, but was not injured upon arrival at the landing platform due to the automated brake. Reich acknowledges that this was an incredibly rare occurrence, but says it demonstrates the value of an automated system. Aerial Design’s Aerial Breaking System (ABS) requires guide involvement in stopping riders. ZipFlyer also employs eddy current technology in its passive braking system. “This gives us the ability to utilize a one-size-fits-all trolley, which accommodates riders 60 to 300 pounds,” says business development and marketing manager Elijah McHenry. “Non-friction braking allows for increased lifespan of trolleys, and eliminates the issue of worn-out brake pads that occurs when using friction braking.” The company’s ZF Track terminal brake also communicates with the launch tower once the brakes have been reset for the next rider. In addition, the company’s trolleys incorporate speed restriction technology, which “allows our braking systems to operate efficiently and effectively,” McHenry adds. Another manufacturer, Zip-Rush, advocates that every site be evaluated for the proper braking system, as “zip line brake design depends on many factors: expected landing speed, available braking and buffer zone lengths, type of trolley, and budget.” For that reason, Zip-Rush provides a range of brake options, including magnetic, progressive, spring brakes, and impact blocks. Spring brakes—a series of springs and spacers installed on the end of the line to stop the rider—are relatively common, both as primary and backup brakes. The coils compress upon impact, slowing the rider. A potential downside is that riders rebound from the impact, and this might require operators to spend time on retrieval, and therefore lower throughput. While this might make spring brakes impractical for many primary brake installations, they can be “great when used as emergency arrest devices,” as Head Rush has written. Manufacturer Zip-Rush sees a versatile use for spring brakes. It originally used a spring brake as an alternative to a rubber stopper, but came to learn that spring brakes have a wider range of applications. Zip-Rush now states that spring brakes are “the perfect alternative to most high-speed zip line landings,” and lists this brake choice as one of several in its product lineup. Requirements for backup, or emergency, brakes constitute a key portion of zip-line standards and regulations. Without engaging in a thorough discussion of the regulations within each jurisdiction in North America, or detailing the exact differences between ACCT, ASTM, and PRCA standards (the ASTM standard is currently undergoing a revision), it’s fair to say that emergency brakes are required in many commercial operations. These backup brakes are typically required to be fail-safe or involve redundancy that makes them effectively fail-safe—redundant systems are highly unlikely to fail at the same time. As a practical matter, a main issue is the amount of room available on the landing platform and in the landing zone to install and operate a backup brake. Cooper saw this firsthand when evaluating courses for potential retrofitting with ZIPKEA installations. “Courses are sometimes built without room for one, so they need something small, and that can be difficult,” he says. Additionally, depending on the type of backup brake used, if it is not self-resetting, guides may need to reset two different brakes for each rider. And that can affect throughput, Cooper points out. In early 2017, Head Rush published a white paper highlighting its policy that requires any system using zipSTOP primary brakes to meet the appropriate standard for emergency brakes, or “emergency arrest devices,” in Head Rush terminology. Head Rush interpreted both the ASTM and ACCT standards to mean that they require a passive and engineerable emergency braking system, and noted that its zipSTOP usage agreement requires such a system. This had a significant impact on the industry. Some operators have been able to meet this requirement easily, but for others it required costly renovations. For its part, Head Rush argues that its white paper only reinforced existing standards. “Those requirements always existed. There was always language about backup brakes, but some of that was falling off the radar, and it needed to be front and center,” notes Reich of Head Rush. 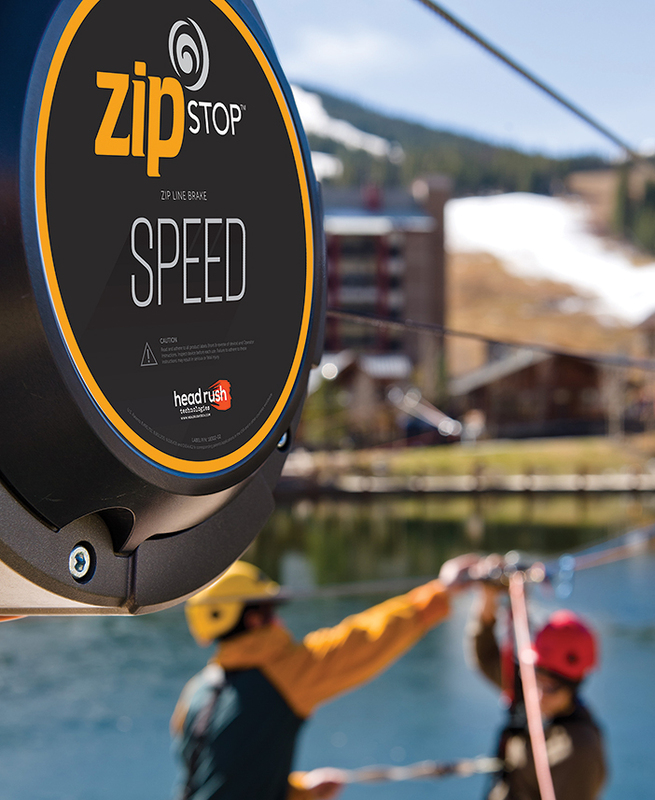 Head Rush’s new ZipSTOP SPEED is a braking system designed to handle arrivals as fast as 45 mph at the end of zip lines. Head Rush recommends use of a second zipSTOP or zipSTOP IR as a backup for a primary zipSTOP brake. 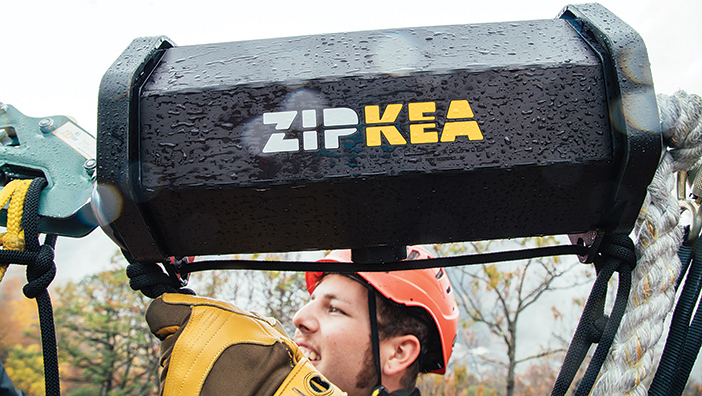 The aforementioned ZIPKEA is another option. Another type of backup brake is the Emergency Arrest Device (EAD) designed by Bonsai Designs, which takes up little space and avoids the need for a long deck that a spring brake can necessitate. For primary brake applications, this system can facilitate easy retrieval of participants who come up short of the landing area. Lallemand reminds that all these options are relatively expensive, compared to the use of a self-retracting lanyard (SRL) and shock packs. “The SRL and shock pack must be engineered for the specific installation,” he cautions. He also points out that braking systems don’t necessarily have to be based on a primary/secondary model. His preferred system involves three levels of braking: it starts with a zipSTOP, then utilizes his ABS system (which serves for both braking and, when needed, retrievals), and a third emergency brake system consisting of an SRL and shock packs. Such a system is not applicable to every zip line, he acknowledges, but he encourages operators to think beyond a simple two-part model. Over the past 30 years or so, zip line braking has evolved from sliding your leather-gloved hand on a cable strung between two trees to utilizing rotating electromagnetic braking technology on a 3,000-foot vertical drop zip line at a 42-degree angle over a roaring ocean. But industry visionaries are looking forward to changes yet to come. Perhaps that something will include zip lines that are curved, not simply straight-line descents. 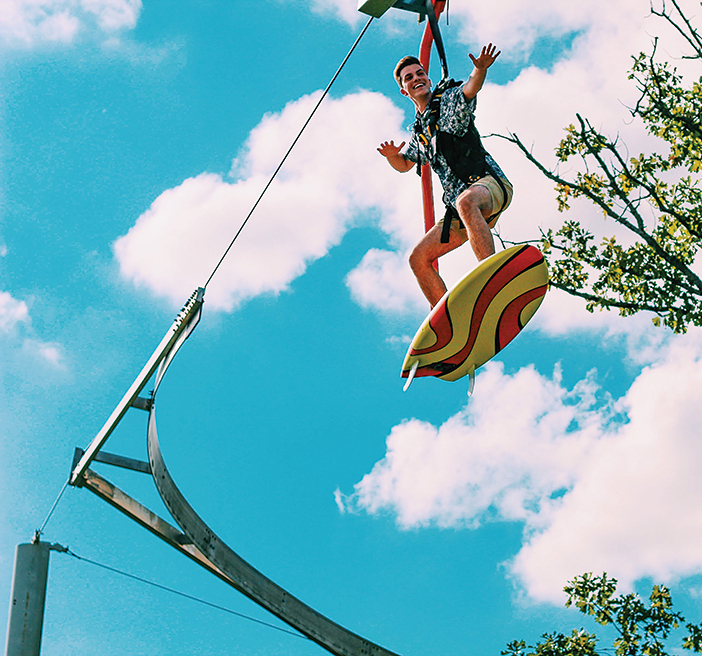 Smith is excited about the recent SkySurfer attraction that opened in August in Missouri, which lets the rider stand on a surfboard and go around corners, brake on the line, and even go uphill. This “zip line” utilizes electric motors, onboard batteries, and computer systems to control the speed of the rider on the line, and regenerative motor braking to slow the rider. Skyline’s new SkySurfer, which opened in August, allows for cornering, braking and even going uphill. Speeds may also increase as some parks aim for “fastest” status. To that end, Head Rush is adding its third piece of equipment to the zipSTOP lineup this fall, the zipSTOP SPEED, which is said to be designed for arrivals at up to 45 mph. How will these and other future innovations impact the industry? Time will tell. “Difficult to see. Always in motion is the future,” as a sage once said. Park Spy:: Hit the Brakes!